This little girl, who is about Oliver's age, is named Stella. She is the daughter of my childhood friend Scarlett and granddaughter to Scarlett's mom, Tonie. I follow your blog and I am so proud of you and your husband. You are both doing a wonderful job raising your boys. You are such a blessing to me. Your strength, honesty, and joy shine through in every word you write. But more important what shines the most is your love for your Savior Jesus. Scarlett's daughter Stella will be 3 years old March 26. Stella is so blessed to have a very large extended family so she is never without tons of gifts for whatever gift giving time it is. This year I decided that instead of toys or clothes I would start donating to different organizations. I donated to the link you had on your blog for CF in honor of Bennett. 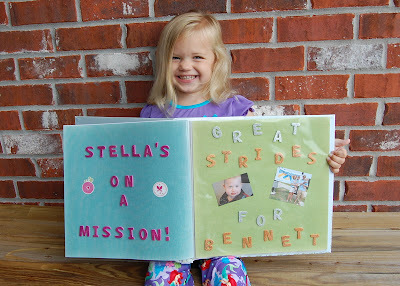 Would you mind if I printed the family picture of you all---I am making a keepsake book for Stella of all of the "Mission Work" so she will see how important it is to give to others." I cannot express just how touching it was to receive the picture of the book that Stella received for her birthday...to see Bennett's picture and the picture of our family in a book made for a little girl to teach her about giving...to know her grandmother gave money to find my cure for Bennett in lieu of giving a little Stella a toy - all in hopes of giving a greater gift to Stella: the gift of happiness through helping others. Not only am I touched, I am inspired. I also want to teach my children about others' needs and to create in them a desire to love and care for others, especially those in need. So, our family is going to create our own book of people whom we are praying for and making sacrifices to help. 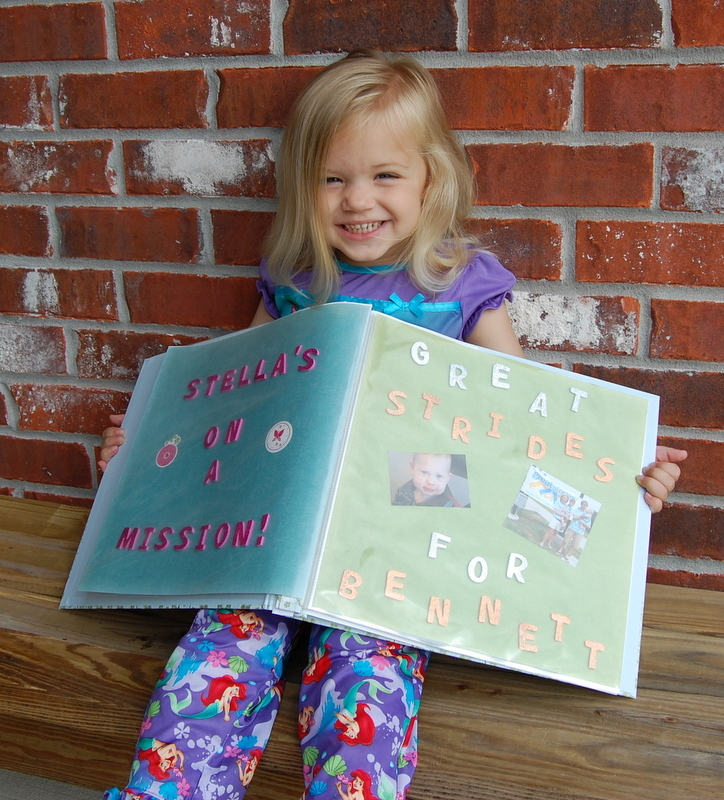 Stella's smile in this picture and her tiny 3 year old fingers holding a book with Bennett's picture is a representation of Ms. Tonie's heart and of the heart she hopes to cultivate in Stella. Clearly, it is us who received such a wonderful gift, even if the gift was ultimately supposed to be for Stella. Thank you, Ms. Tonie, for blessing our family and inspiring us to do the same for others. Oh wow, what a wonderful gift and email! Those are the ones that bring tears to my eyes. We are all blessed that we have so many people that fight as hard as we are. They remind us, all is not lost. When you get a chance Breck, can you email me some more about Oliver? You left a comment on my blog about how Oliver is a lot like Ben and not talking just yet. I'd LOVE to hear your input and what you did to help him along. How special that is...and how amazing it is that people are so giving to find a cure. Stella will grow up learning more than most children about the importance of thinking about others. Thanks for sharing this moving story.